Ban Youth Tackle Football? No Way. Home / Blog / Ban Youth Tackle Football? No Way. 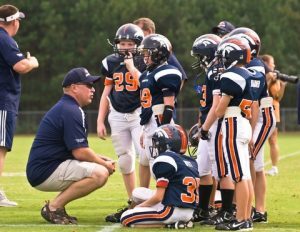 California, Illinois, Maryland and New York recently introduced legislation to ban youth tackle football prior to an unspecified age. These are knee-jerk reactions to concerns over chronic traumatic encephalopathy (CTE). In my opinion, this is ridiculous and based on untested theories, not on current, peer-reviewed, scientific studies. I try to be one of the few voices of reason in the panicky discussion of concussions and CTE in youth football. The media continually fuels the concussion conversation with emotionally-packed and hyperbolic statements. They do this because it sells and keeps readers/viewers tuned in, which is what their advertisers want. Also, many researchers need for youth tackle football to be “very dangerous” so their funding will continue to pour in. My message, on the other hand, is the importance of risk management and relying on science. I never downplay the risk of concussions or the seriousness of such injuries. I urge my clients to pay attention to peer-reviewed scientific research and not pay serious heed to unproven theories backed by anecdotal, non-scientific studies. A good example is this recent study that found no clinically significant harmful association between playing football in high school and increased cognitive impairment or depression later in life. Vindication of my stance can be found in the recent article “Does CTE call for an end to youth tackle football?” In it, 26 brain injury experts from 23 U.S. and Canadian universities and hospitals state what I’ve been saying for years. And they have the science to back it up. One thing I learned is that CTE presents in approximately 12% of healthy people who died at an average age of 81 years. The authors make many interesting points on the topic. But their bottom line is that there is no strong scientific evidence that links youth sports to brain injury, brain injury to CTE, and CTE to dementia. They refer to three recent studies published in peer-reviewed journals. None found any increased risk for long-term brain damage in older men who played high school football. They encourage further research to understand the many different variables involved in CTE and to attempt to isolate participation in youth tackle football. Learning invaluable lessons through sports such as teamwork, sportsmanship and commitment. Role modeling through adult administrators, coaches, and other staff. And what about the other sports that have high rates of concussions such as hockey, rugby, lacrosse, and soccer? Could it be that politics is playing a role in zeroing in on football? And why is the government getting involved in making decisions for parents when it comes to participation in youth tackle football? There are others out there who think the same way I do. These doctors wrote their fact-based article so eloquently that I encourage you to read it in full for yourself.